The fresh anointing on Senior Pastor Shawn L. Bell, complemented with an insight in the revelation of God’s word, is touching the hearts of people around the country. It is very evident that God has raised Pastor Bell up to challenge the Body of Christ out of their complacency. With a perfect merging of foundational structure from both The Historic – Church Of God In Christ and A.M.E. Zion Church, he continues to take people from destruction to their destiny, while carving a path to spiritual renewal. He began his education in the Gaston County (NC) Public School System, and later matriculated through the Livingstone College and Clinton College earning a degree in Liberal Arts. It is of greater knowledge to couple education with experience. At the tender age of 15, Pastor Bell ministered his initial sermon at Vestibule A.M.E. Zion Church (King’s Mountain, NC) under the tutelage of his Pastor and (natural) Father, The Reverend Cornelius Bell. Ordained and Pastoring in the A.M.E. Zion Reformation at 18, by The Bishop George Edward Battle, Jr., the pursuit of excellence was always a familiar mark set by Pastor Bell. God has afforded Pastor Bell, throughout the years, the opportunity to serve in various international areas, most notably he serves on the Board of Directors of Dr. Thomas A. Dorsey’s National Convention of Gospel Choirs and Choruses…which he was appointed by his spiritual mentor, The Late Bishop Kenneth H. Moales. For 8 years Pastor Bell served the Office of International Director of Marketing and Public Relations for the Mount Calvary Holy Church of America under the leadership of Archbishop Alfred A. Owens and Co-Pastor Susie C. Owens. In September 2016, Pastor Bell connected to the Global United Fellowship under the leadership of His Grace, Bishop Neil C. Ellis, Presiding Prelate (Global United Fellowship). February 2017, Bishop Ellis appointed Pastor Bell the District Leader over the State of Maryland and District of Columbia in which he oversees 40 plus 9 churches. 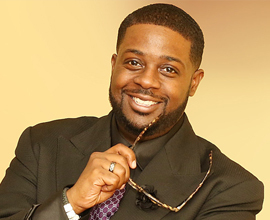 Pastor Bell travels extensively throughout the country ministering in conferences, worship celebrations and leadership seminars. His gifting is recognized by many key leaders of the world to be in the forefront of the apostolic and prophetic function within the Body of Christ. Pastor Bell is not only anointed to preach and teach the word of God, but he also has been blessed musically as a vocalist. He has shared the stage and worked with numerous Recording Artists in workshops, seminars and the like. Pastor Shawn along with his wife, Lady A. Faye Bell are the Establishmentarians of The Greater Paradise Christian Center, an exciting, urban and thriving church located in the City of Baltimore. Paradise has been impacting the Baltimore/Washington Metropolitan area since 2003 by challenging its members to realize and fulfill their regional and global responsibilities. With well over several hundred (active) members, GPCC is recognized as a holistic center of Hope on the cutting edge of new innovative ways for presenting ministry. Many of the groundbreaking initiatives include the GPCC Center of Hope Community Development Cooperation, which houses both Adult Day programs and Youth driven activities; the Paradise Touch Apparel and Hair Salon; along with the 180-seat Eating and Dining Facility. Pastor Bell has prophetically challenged the people of God spiritually, and economically to remove traditional mindsets and replace them with Kingdom Building mentalities. In addition to all of Pastor Bell’s accomplishments, his role as husband to A. Faye Bell and father to Olivia L. Bell has bought the most fulfillment. When you experience the ministry of Pastor Bell, you will quickly recognize the sovereignty of God upon his life, family, and ministry.